The (horizontal) rows in Tom’s Planner are usually used to list the activities in a project but they can also signify resources or assets in your schedule. You can organize your rows in several groups. Inside these groups you can indent rows to create sub groups. 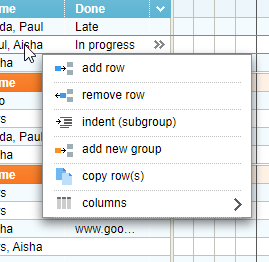 You can insert or remove groups and rows by right clicking the left area of your schedule. To sort rows or groups just drag and drop them up or down with your mouse. click the ‘open schedule’ button in the top toolbar and open the schedule you want to copy your rows or groups to. the schedule you were working in will be closed and replaced by the new schedule you are opening. now you can right click any group or row and choose paste row/group and the rows or groups from the previous schedule will be inserted in the new schedule.